Associated Press Bengals defensive end Carlos Dunlap tries to recover the ball after stripping it from Colts quarterback Andrew Luck during Sunday's game in Indianapolis. INDIANAPOLIS – The Indianapolis Colts spent the offseason investing in Andrew Luck's protection plan. After one week, they like the results. 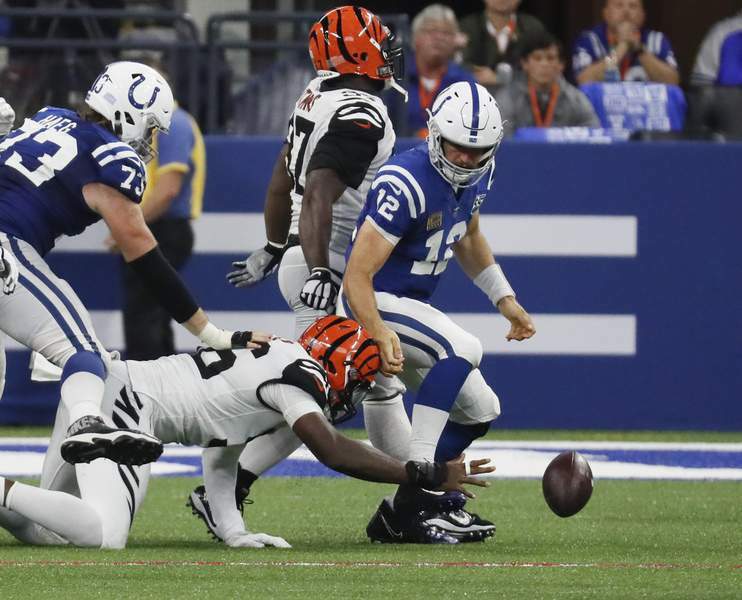 Sure, Luck was sacked twice and hit seven more times in Sunday's season-opening loss, but a makeshift offensive line with three new starters held up perhaps better than expected. “I'm not sure I've ever seen an offensive line pass protect as well as they did,” offensive coordinator Nick Sirianni said Tuesday. Sirianni was most impressed by the teamwork from the starting five and their willingness to do whatever it took to keep Luck upright after going more than 20 months between regular-season starts. Plus, the Colts (0-1) weren't even close to full strength – and they may not be again this weekend at Washington. Left tackle Anthony Castonzo, Luck's longtime blind-side protector, injured his hamstring between the end of mini camp and the start of training camp. He returned briefly after being placed on the physically unable to perform list, then reinjured the hamstring before the preseason opener. Castonzo hasn't played since and was limited in practice all last week. Denzelle Good looked like the probable starter at right tackle heading into the preseason but hurt his knee and wrist in Week 3 of the preseason and sat out all of last week. Indianapolis danced around those absences by plugging its most versatile lineman, Joe Haeg, into Castonzo's spot on the left side, and putting veteran J'Marcus Webb, who didn't even play in the NFL last season, in Good's spot on the right side. The Colts' plight may have taken another hit when Webb injured his hamstring on Clayton Fejedelem's clinching 83-yard fumble return to seal Cincinnati's victory. Webb was placed on injured reserve Tuesday. But the Colts' options are limited. Haeg could swing back to the right side, where he is more familiar, if Castonzo starts. The only other tackle on the active roster is Le'Raven Clark, a third-round pick in 2016 who was inactive against the Bengals. What else could the Colts do? Second-round pick Braden Smith lost out on the starting job at right tackle during the preseason, and the only other lineman on the active roster is veteran guard Mark Glowinski, who started 19 games in three seasons with Seattle. He, however, is listed as a guard. “You have to find a groove so that you're ready whenever your name is called,” Smith said. The Colts certainly didn't play a perfect game Sunday. Sirianni acknowledged there were some missed assignments and they need to run the ball consistently. But he figures if the Colts continue to protect Luck the way they did for 55 passing attempts, Indy's starting quarterback should be in good hands – regardless of the starters.